LORDS RANSOM (g. by Jeune). 11 wins from 1600m to 2400m, A$869,845, WATC CB Cox S., Gr.2, Perth Cup, Gr.2, Belmont Classic, L, Bunbury Cup, L-twice, Pinjarra Cup, L-twice, WATC Dayana P., Bunbury RC AHA Cup, 3d MVRC Rosebud RSL H.
PALACE INTRUDER (g. by Oratorio). 3 wins-2 at 2-at 1000m, 1800m, A$222,800, to 2014-15, WATC Aquanita S., L, Westspeed 2YO P.-twice, 2d WATC Challenge S., L, Westspeed 3YO H., 3d WATC Westspeed H.
King of the Palace (g. by Danehill Express). 5 wins. See below. Castle Keep (f. by Oratorio). 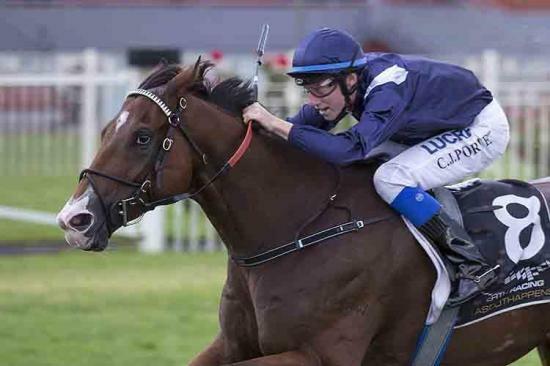 Winner at 1000m in 2014-15, 3d WATC Perth Racing on Facebook & Twitter H., PR Summer Carnival H.
Fortunellin (f. by Jeune). 2 wins at 1600m, 1700m in Aust. Palace Alice (Palace Music). 10 wins. See above. Cheerful Happiness. 5 wins at 1400m, 1600m, HK$2,515,125, HKJC Panasonic Nano Ion Air Purifier H., Tseung Kwan O H., Orchid H., Wo Che H., Wuhu H., 2d HKJC Yue Yee H., Top Gain H., Hung Hom H., Red Ruffian H., Wang Chau H., 3d HKJC Tak Ku Ling H., Old Bailey H., Shau Kei Wan H., Yuen Wo H., Tai Wo Hau H., Chow Tai Fook Aura Series H.
New Face. 3 wins at 1400m, 1650m, HKJC Shek O H., Fuk Loi H., Lark H., 2d HKJC Queen's Road East H., 3d HKJC Graham H., Caroline Hill H., Choi Wan H., Findhorn H.
Ezyaz Oscar. 4 wins from 1100m to 1600m, A$94,252, to 2014-15, 3d MRC (Mornington) Spiral Logistics P., Showtime Attractions H.
Jenna Coup. Winner at 1100m, 3d Otago RC Danzighill H. Producer. Al Damas. Winner at 2100m in NZ. Egoistic. Winner at 1400m in Aust. SIR AVON (Avon Valley). Joint second top colt on The 1980-81 NZ 3YO Free H. 6 wins from 1200m to 2500m, NZ$37,325, A$82,790, New Zealand Two Thousand Guineas, Gr.1, VRC Queen Elizabeth S., Gr.2, Canterbury Gold Cup, Gr.2, STC WJ McKell Cup, L, AJC Milperra H., 2d AJC Cabochon H., L, STC Shannon H., L, Winter Cup, L, 3d VRC LKS Mackinnon S., Gr.1, ARC Great Northern Guineas, Gr.2, Sydney Turf Club Cup, Gr.2, STC Civic H., L, 4th AJC George Main S., Gr.1, VRC Melbourne Cup, Gr.1, Great Western H., L. Sire. Gold Condor (Avon Valley). 3 wins at 1400m, AJC Gallipoli Welter H., Scobie Breasley H., Pharos H., 2d AJC Final H., 3d STC Phar Lap S., Gr.2. Perth Cowboy (Best Western). Placed, 2d VRC Eurovox S.H., L.
Vigna Marina. 4 wins-1 at 2-at 5½f, 6f, QTC Woodonga Nursery H. Producer. Bye Babe. 3 wins at 1600m, ARC Hobson H., Avondale JC Victory H.
AIMING-HIGH AS A KITE (Aust.) (Double Nearco). 9 wins from 1100m to 1600m, A$88,515, VATC Victoria H., Gr.3, Fosters Lager H., 2d VATC Eclipse S., L, 4th MVRC Waterford Crystal Mile H., Gr.3. CAPTAINCY (Swiftly Morgan). 10 wins from 1000m to 2450m, Murrumbidgee TC Wagga Gold Cup, L.
Race Record: 14 Starts 5-2-0 A$90,592. 5 wins at 1000m, 1200m, A$90,592, to 2014-15, WATC Vale Andrew Ramsden H., Crown Lager H., 2d WATC Perthracing.com.au H.